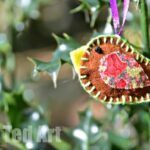 I made these recycled Christmas Ornaments “on a whim”, earlier in the week and thought I would share these with you today. 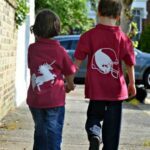 Not only are they “recycled”, but they are also lovely keepsakes. 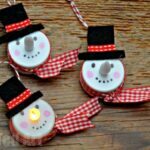 We love making all sorts of DIY Ornament Ideas ! 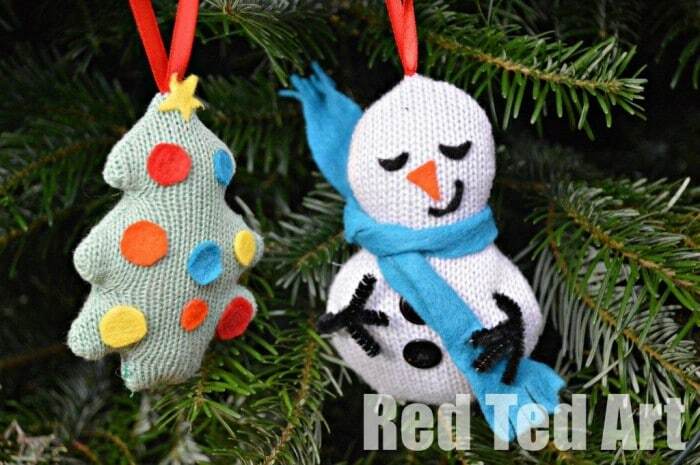 The green Christmas Tree Ornament is made from one of Pip Squeak’s (stained) cardigans and the snowman is made from one Red Ted’s (also stained) baby cardigans (we do love a good Snowman Craft). So we couldn’t pass them on…. 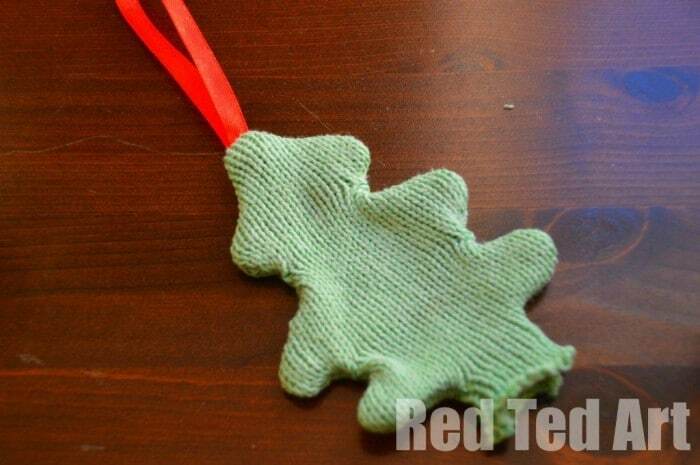 and now we have a lovely little “no knit” knitted momento from them. Toy stuffing or old tights to fill. 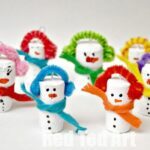 For the snow man some pipecleaners for the arms. 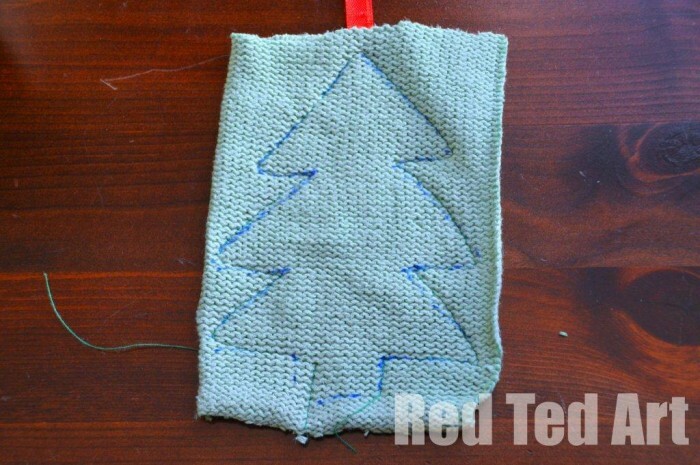 1) Trace your Christmas Tree or Snowman Pattern onto the REVERSE side of your old cardigan. 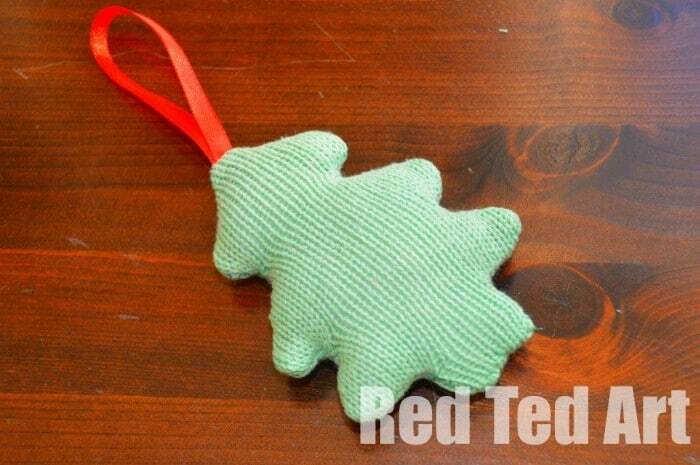 Insert your ribbon for hanging. 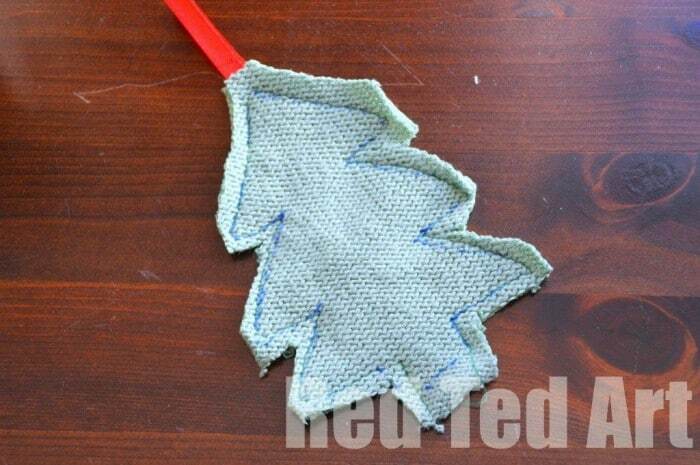 4) Turn right side round, it may look a little funny, but you can reshape with stuffing. 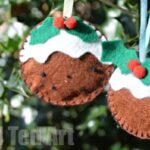 6) Decorate with felt or buttons! I played “around” for a while until I liked the look of the tree and the snowman! 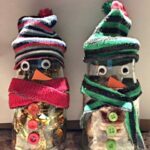 For the pipe cleaner, I “stuck” the pipecleaner into the snowman as far as possible and then sewed in place to secure them a little. The scarf is just “wrapped around” his neck and I cut some strips into the ends to make “tassles”. Pip Squeak took a shining to these straight away.. I think they are her favourite this year! 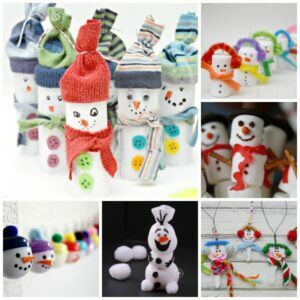 Looking for more Snowman Crafts? Take a peak! Oh they are VERY cute! If I don’t make some this year I’m popping them on the list for next! Oh yes, I do hope you make some!! Glad you like them Chris! 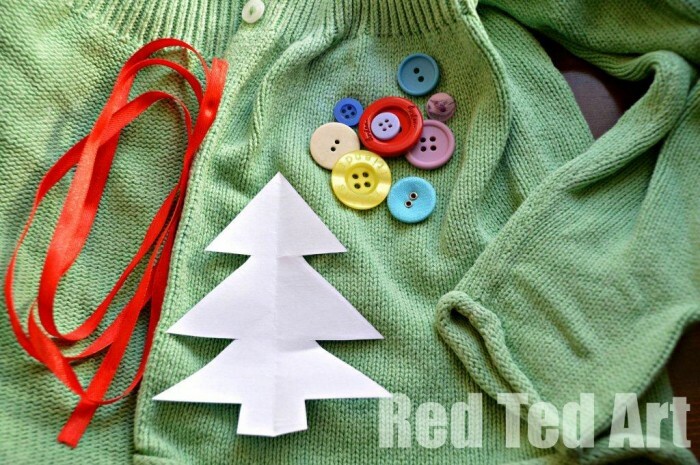 What a brilliant idea to remember cute outfits & memories associated with those clothes each Christmas season…love it! Yes, and you could make more than one and pass them onto the children when they are older! oh love them ! 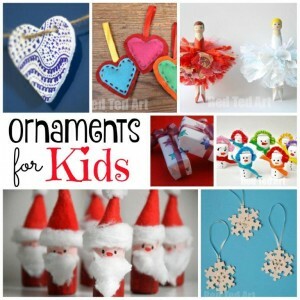 What great little keepsake ornaments. 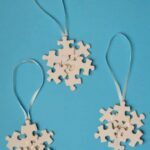 I hope you have a go at making some! 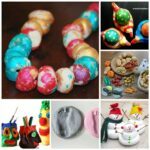 What a cute way to reuse! Oh my, what a very cute and practical idea. I love these. It’s good idea ! Thank you for tutorial !